Here in Westminster, things haven’t been “business as usual” for quite some time. But this week outdid itself, with every day delivering an odd surprise – and the funny reactions to match. These are just some of the weird and wonderful things to have taken place in SW1A over the past five days. Listen: Brexitcast – WhatsApp is in Control! Then boom! Twelve naked people crash into your office and demand action on climate change. On Monday, activists took over the public gallery in the Commons during a debate on indicative Brexit votes, with slogans painted across their bodies. Media captionSemi-naked climate change protester on interrupting Brexit debate. MPs courageously carried on, with the odd reference ad-libbed into their speeches and a hair-raising facial expression or two, as some of the protesters managed to glue themselves to the security glass. It took the police a fair while to unstick the group and carry them off the premises, but the imprints of their backsides remained for some time – both on the glass and in our memories. Every week, Theresa May summons her cabinet to No 10 for a chat (row) about the latest direction of the government. These occasions tend to last for about two hours before the top brass can head back to their departments and maybe get on with some non-Brexit related work – Steve Barclay is exempt from this, of course. But on Tuesday, after ministers arrived at Downing Street, the doors were locked and they were stuck in talks for more than seven hours. But no, these ladies and gentlemen had to come up with an answer to the Brexit deadlock. 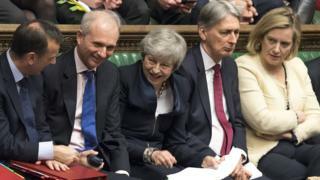 To stop them telling gossip-hungry journalists what had been decided before she did, Mrs May is said to have shut them up in the cabinet room, confiscated their phones and fed them “cheap Chilean red wine”. Wednesday: Message from the gods?